Product #3346 | SKU ADI8QS | 0.0 (no ratings yet) Thanks for your rating! The ADI-8 QS from RME is their top of the line, eight-channel analog-to-digital and digital-to-analog converter that balances excellent analog circuit design with the latest in converter technology. The combination provides conversion of the highest order along with a healthy supply of features. 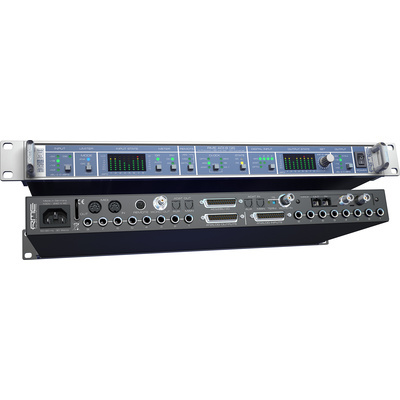 The unit is outfitted with both balanced 1/4" phone input/output connectors, along with 25-pin D-sub connectors, the latter providing slightly higher maximum output levels. Conversion is available to/from AES/EBU and ADAT optical at sample rates up to 192kHz for the AES/EBU streams and 96kHz for ADAT. Efficient jitter reduction via SteadyClock guarantees prestine sound quality while Intelligent Clock Control (ICC) will retain the last valid sample frequency in case of a loss of the input signal. SyncCheck ensures perfect synchronization and excellent detection of errors, allowing multiple units to be stacked and operated sample-aligned, using word clock. All settings are stored when the unit is switched off.